RDS - enable decode of station and song identification from an FM signal. I'm not sure why you'd ever disable this. FM - switch to FM radio. AM - switch to AM radio. CD-C - switch to CD Changer mode. 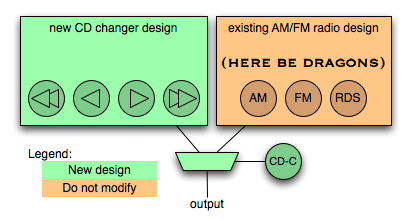 Once in CD-C mode, the RDS/FM/AM buttons have no effect until you push CD-C to get back to Radio mode. This makes perfect sense, right? I mean really, once I'm in the CD player mode I wouldn't expect the buttons from Radio mode to do anything, would I? Yes, this is sarcasm. On the web. Dangerous, I know. I'd speculate that the fine engineers at Blaupunkt did not actually want the user interface to be this way, and that they would have preferred the FM button to always switch to FM radio. I suspect they were presented with an existing AM/FM radio design which, for whatever reason, they could not modify. Perhaps the CD50 project had a very tight budget, or a narrow market window which didn't allow time to tweak the radio components. Less charitably, perhaps the radio design had degenerated into an unmaintainable mess and any change risked breaking the whole thing. The path of least resistance to get the product out is a mux: you're either in our new mode where we add all the shiny new goodness, or the crufty old mode where we haven't touched anything from the existing design. The situation of an unmaintainable portion of a system should be familiar to any software developer tasked with working on a large codebase. I suspect the natural entropic state of software is unmaintainability, requiring constant infusions of energy to stave it off a while longer. So what can we do to ensure systems remain maintainable? Unit testing is frequently suggested as an answer, though I've never been a fan of extensive unit testing. If the target platform is very different from the build system, structuring the code to be able to run unit tests is a non-trivial amount of extra work. However I've recently started working in an environment where development testing is strongly encouraged, and I have to admit it does help in keeping code maintainable as developers come and go. The lowest level unit tests are not terribly useful in this regard; even code in a complete mess will have unit tests. On the other hand, a functional testbench for a module where the interfaces to the rest of the system are mocked out is very helpful. You have a much firmer grasp of how changes you make in the module are going to impact the rest of the system. You also have more hope of being able to reimplement the module, as its interfaces are described by the mock framework. If other portions of the system reach in to the internals of the module without using the interfaces... then the cancer has already metastasized and you're probably doomed. People say that refactoring early and often will keep code maintainable, but that requires agreement from management to spend development time paying off technical debt without an increase in marketable features. In a product environment I rarely win that argument. However, I've now worked on a complete re-implementation of two different systems where the bug load had simply become impossible due to indecipherable engineering. I suppose that is an extreme form of refactoring: extract the best bits of the old system, and throw out the rest. 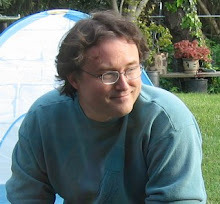 Do you have tips for keeping code maintainable across multiple generations of products? This site uses Disqus for comments. You can comment anonymously if you wish, or use an existing identity like Twitter, Facebook, or any OpenID provider.